The Treaty of Reciprocity (1875) between the United States and the Kingdom of Hawai‘i eliminated the major trade barrier to Hawai‘i’s closest and major market. Through the treaty and its amendments, the US obtained Pearl Harbor and Hawai‘i’s sugar planters received duty-free entry into US markets for their sugar. At the industry’s peak in the 1930s, Hawaiʻi’s sugar plantations employed more than 50,000 workers and produced more than 1-million tons of sugar a year; over 254,500-acres were planted in sugar. Sugar cultivation exploded on the Big Island. As a means to transport sugar and other goods, railroading was introduced to the Islands in 1879. On March 28, 1899, Dillingham received a charter to build the original eight miles of the Hilo Railroad that connected the Olaʻa sugar mill to Waiākea, that was soon to become the location of Hilo’s deep water port. Rail line extensions continued. Extensions were soon built to Pāhoa, where the Pahoa Lumber Company was manufacturing ʻōhia and koa railroad ties for export to the Santa Fe Railroad. Although not the first railway on the Big Island, the Hilo Railroad was arguably the most ambitious. The Olaʻa line was completed in 1900, immediately followed by a seventeen mile extension to Kapoho, home of the Puna Sugar Company plantation. Immediately after that two branch lines were constructed (also to sugar plantations,) and then the railroad was extended north into Hilo itself. All the sugar grown in East Hawaiʻi, in Puna and on the Hāmākua Coast, was transported by rail to Hilo Harbor, where it was loaded onto ships bound for the continent. An early account stated that the rail line crossed over 12,000 feet in bridges, 211 water openings under the tracks, and individual steel spans up to 1,006 feet long and 230 feet in height. Some of the most notable were those over Maulua and Honoliʻi gulches, the Wailuku River and Laupāhoehoe. Over 3,100 feet of tunnels were constructed, one of which, the Maulua Tunnel, was over half a mile in length. While the main business of the railroad remained the transport of raw sugar and other products to and from the mills, it also provided passenger service. A chiefly tourist line, branching from Olaʻa, was built inland 12.5 miles up the mountain to Glenwood where visitors to the Volcano House near Kilauea Volcano would then transfer to buses. Due to stiff competition from motor vehicles, the Glenwood extension was scaled back to Mountain View in 1932. Between 1909 and 1913, the Hāmākua Division of the railroad was constructed to service the sugar mills north of Hilo. Unfortunately, the cost of building the Hāmākua extension essentially destroyed the Hilo Railroad, which was sold in 1916 and reorganized as the Hawaiʻi Consolidated Railway. Not for the faint of heart, these trips included a stop on the trestles, where passengers disembarked to admire the outstanding scenery. The Great Depression saw a decrease in business, but business picked up in the 1940s, when thousands of battle-weary troops packed the passenger cars en route to Camp Tarawa, in Waimea, to rest, recuperate and prepare for another campaign. But the end was near for the Hawaiʻi Consolidated Railway. Early in the morning of April 1, 1946, a massive tsunami struck Hawaiʻi. The railroad line between Hilo and Paʻauilo suffered massive damage; bridges collapsed, trestles tumbled and one engine was literally swept off the tracks. The expensive option of rebuilding the railway was rejected. Hawaiʻi Consolidated offered the rights-of-way, tracks and remaining bridges, trestles and tunnels to the Territory of Hawaiʻi, but the offer was refused, and finally the company sold the entire works to the Gilmore Steel and Supply Company. At the time of the tsunami, plantations were already phasing out rail in favor of trucking cane from the field to the mill. It was inevitable that trucking would also replace rail as the primary means of transporting sugar to the harbor. The tsunami accelerated that transition. Most sugar from Hāmākua was trucked to Hilo Harbor, although the Hāmākua Sugar Company continued to use its offshore cable landing at Honokaʻa until 1948. A few remnants of the railway are still visible. Hawaiʻi Consolidated’s yards were in the Waiākea district of Hilo, where the roundhouse still stands today, next to the county swimming pool on Kalanikoa Street. In Laupāhoehoe, a concrete platform remains where Hula dancers once performed for tourists. And the Laupāhoehoe Train Museum is housed in the former home of Mr. Stanley, the superintendent of maintenance. Today, the Laupāhoehoe Train Museum and Visitors Center keeps the memory of Hawaiʻi Consolidated Railway alive. Although the Laupāhoehoe Train Museum is among the state’s smallest museums, it attracts an estimated 5,000 visitors a year. The admission fee is $4 for adults, $3 for seniors, and $2 for students. Special rates for tours are also offered. 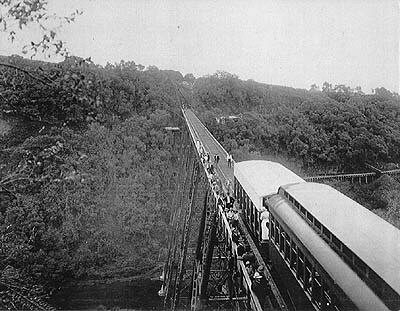 The image shows passengers out on the trestle enjoying the view. In addition, I have added some other related images in a folder of like name in the Photos section on my Facebook and Google+ pages.